Maple Wood Marina is a minor waterways place minor waterways place place on the waterways major waterways place village town city on the Staffordshire and Worcestershire Canal (Main Line: Autherley to Great Haywood) between Acton Moat Bridge No 92 (Acton Trussell) (1 mile and 5¼ furlongs and 1 lock to the south) and Staffordshire and Worcestershire - Stafford Branch Junction (Junction of the Staffordshire and Worcestershire Canal with the Stafford Branch.) (1 mile and 3¼ furlongs to the north). The nearest place in the direction of Acton Moat Bridge No 92 is Hazelstrine Bridge No 96; ½ furlongs away. The nearest place in the direction of Staffordshire and Worcestershire - Stafford Branch Junction is Radford Bridge No 98; 5¾ furlongs away. Mooring here is ok (a perfectly adequate mooring) , no information available. 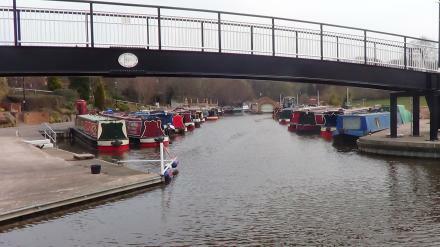 Moorings are available at Maple Wood (Stafford Boat Club). Free good moorings opposite club and up and beyond Deptmore Lock. Facilities: diesel for sale, chemical toilet disposal, gas for sale, boatyard pump-out, telephone, water point and laundrette. The place is a Marina and a Visitors Mooring. Information last edited Wednesday the 17th of January, 2018 at 10:34 PM by Shultzy. Radford Bank, Stafford, ST17 4PG — 1433 yards to the north. Wildwood Shopping Centre, Stafford, ST17 4RA — 753 yards to the northeast. 57 – 59 Bodmin Avenue, Stafford, ST17 0EF — 1551 yards to the northeast. Mospit, Stafford, ST174HJ — 1368 yards to the west. 34 Silkmore Crescent, Stafford, ST17 4JL — 1343 yards to the northwest. Baswich Library, Lynton avenue, Stafford, ST17 0EA — 1485 yards to the northeast. Stafford — 1115 yards to the north. Stafford, WS11 8LA — 1211 yards to the west. Maple Wood, Stafford, ST17 4SG — 37 yards to the east. 13 firbeck gardens, Stafford, ST174QQ — 1031 yards to the north. Stafford — 1449 yards to the west. Stafford — 1585 yards to the north. 55 Bodmin Ave, Stafford, ST17 0 — 1562 yards to the northeast. Manchester — 1308 yards to the north. 5 The Bramblings, Stafford, ST17 4RL — 698 yards to the east. Stafford — 1395 yards to the east. Within Francesco Group, Weeping Cross. 45 Bodmin Avenue, Stafford, ST17 0EF — 1339 yards to the northeast. Wildwood Shopping Centre, Stafford, ST17 4RA — 755 yards to the northeast. Stafford — 1558 yards to the north. Stafford — 737 yards to the north. Stafford — 758 yards to the northeast. Old Rickerscote Lane, Stafford, ST17 4 — 1144 yards to the west. Stafford — 234 yards to the east. Lichfield Rd, Stafford, ST17 4PQ — 1351 yards to the north. Sharnbrook Grove, Stafford, ST17 4PN — 525 yards to the northeast. Exeter Street, Stafford, ST17 4EG — 1550 yards to the northwest. 45 Weeping Cross, Stafford, ST170DG — 1339 yards to the northeast. Stafford — 1030 yards to the east. Inglemere Drive, Stafford, ST17 4QX — 750 yards to the northeast. Wildwood Drive, Stafford, Stafford, ST17 4N — 540 yards to the north. Oakridge Primary School, Silvester Way, Stafford, ST17 0PR — 1204 yards to the east. Doncaster — 1327 yards to the west. 1553 yards to the northeast.